Bihari Lal Sharma’s at Takka Bench is the first fruit chat seller in Shimla, Himachal Pradesh. Serving since 1948 – proudly written at his stall. 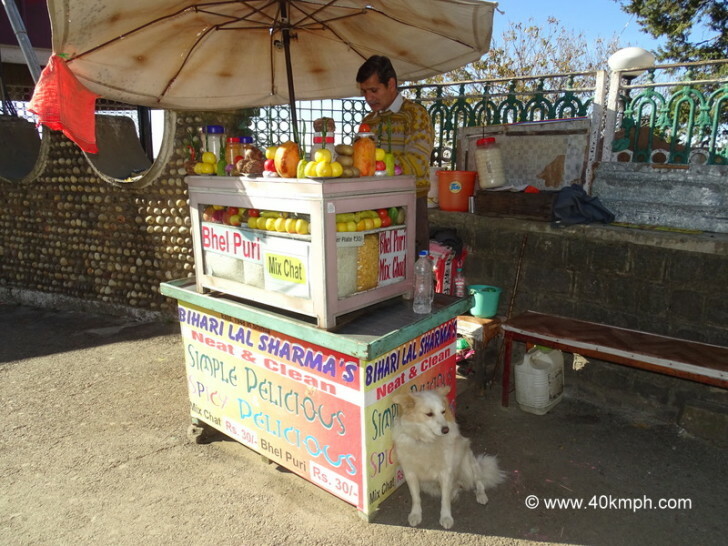 Bihari Lal Sharma was the man who started selling fruit chat and bhel puri for the first time in Shimla. Now his son Ram Pal Sharma is taking care of the business of chat since 30-32 years. His stall is at the entrance of Jakhu road. If you are walking for Jakhu temple nearby Christ Church in Shimla the very first stall of fruit chat is Bihari Lal Sharma’s stall. Upon query about Takka bench, Ram Pal Sharma enhanced knowledge – earlier there was one takka fee to enter a park nearby thus the area is known as Takka bench. We requested for a plate of fruit chat. Rs. 30/- the charges and taste – delicious.